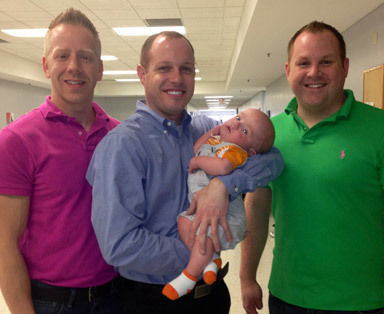 Friday April 19, Charles and Wesley were scheduled for their adoption finalization conducted by David Cole's Law Firm. The guys were very well accepted into the court room with people congratulating them on their beautiful little boy named Tanner Jacob, that will reside back in Round Rock, Texas. The judge signed off on the motion moving the name to Tanner Jacob and removing the birthmom's name from the birth certificate. At the conclusion of the adoption Tanner was given a stuffed animal by the presiding Judge located in Dallas County Family Court. I asked the Charles & Wesley about their experience with Lifelong, they said they were very pleased and have friends asking them how did this happen so fast for you both. They adopted in 4 months with Lifelong and said overall excellent comments about Lifelong. I asked them when they would be back for their 2nd child, they both said within a year. Charles & Wesley come from families where they did not grow up close in age with their siblings. They felt this was most important to them to not allow this to take place in their home with Tanner.